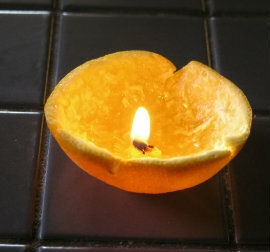 Create orange tea-light candles, and you will find that they actually do burn. 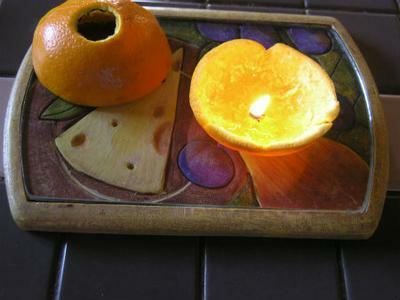 I saw this orange peel craft to make candles and didn't really believe it, so I had to try it for myself. I was pleasantly surprised. We get bags of oranges with full intentions of eating them up quickly, but sometimes, it just doesn't happen. They tend to hang around longer than they should. This craft is a great way to get you to eat that orange (which is of course very good for you) and still be able to use the orange peeling at the same time. Also, it's a form of recycling. If you are baking, making orange juice, or for whatever you need to peel an orange for, make use of the orange peel to create a neat little candle (or a bunch of them) for your kitchen counter. The trick is when you create orange tea-light candles, you have to know ahead of time, and cut the orange properly. You need very few supplies. Take your knife, and start slicing your orange halfway down and around, but do not slice the orange in half. The idea is to slice just through the peel, follow around in a circular motion, and then stick your thumb up under the peeling to pull the orange out, like turning your orange inside-out. You want your peeling inside to be as clean and dry as possible with no actual orange fruit still left inside. Very Important - When you pull the peeling from the orange, don't let the part that has the "orange stem" inside break off. This will be the wick of the orange tea-light candle. Now you have two halves of orange peel. Cut a tiny hole in the top of the orange half that will be your top to let any smoke out when burning. In the other half, pour in a little extra virgin olive oil around the orange stem. Let the stem soak up the oil, but don't cover or drown the orange wick. It may take a few tries (took me three) to light it, but it will light eventually. With the top half of the orange peel, you can cut some designs in the peel if you like, or make slits with the knife. I only did this once, and my cutting skills definately need improvement. With a little fine-tuned skill, you can do this. 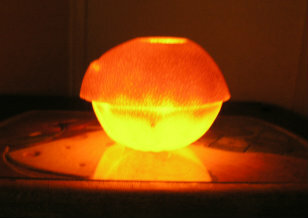 To create orange tea-light candles I would recommend a large orange, a steady hand and a little patience. It's really a fairly easy craft to do and by the way, they smell great!